Ted Burke LIKE IT OR NOT: Dylan joins the Canon? Ted,this debate has been going on for 40 years, at least. There seems to be this nagging obsession with wrapping people like Dylan in ivy vines and sticking them in an alcove between Maxwell Bodenheim and William Cullen Bryant. 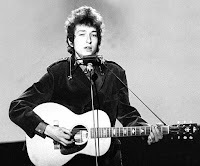 To subject Dylan to academic scrutiny seems to have two goals: One, to find something in popular culture worth elevating into serious literature and Two, to keep songwriters relegated to the realm of lesser craftsmen. I agree with you that Dylan’s rightful peer is Stephen Foster or Ira Gershwin, rather than the likes of Pound or Elliot. Actually, rather than picking apart his songs, I think the most fruitful line of Dylan study is sociological. The single most significant thing about him may be his repeated ability (at least until the mid-1980s) to be in sync with the cultural shifts among young people. His retreat from snotty surrealist speedfreak verse into paired down, semi-biblical family-oriented poesy between 1966 and 1968 was especially prescient. (Even the self-absorbed nastiness he displayed in “Like a Rolling Stone,” ”Positively 4th Street,” etc. mirrored the narcissism of his peers – they identified with his contempt, even if was directed at them.) Dylan’s most productive years can be seen for a search for normalcy, which is either inspiring or depressing to behold depending upon the respect you give to Western bourgeois civilization. His post-Christian period work can be seen as a synthesis of his various phases, as an acceptance of life’s contradictory truths or as the dedication of a professional tunesmith to keep on working until he drops – possibly all three. I’m not sure the hallowed English departments of academe are ready to dissect Dylan on these terms.